1. Manufacturer or brand name Manufacturer or Brand name is shown. 2. Tire size designation A tire’s sidewall is marked with a tire size designation. You will need this information when selecting replacement tires for your car. The following explains what the letters and numbers in the tire size designation mean. P - Applicable vehicle type (tires marked with the prefix “P” are intended for use on passenger cars or light trucks; however, not all tires have this marking). 205 - Tire width in millimeters. 55 - Aspect ratio. The tire’s section height as a percentage of its width. 16 - Rim diameter in inches. 89 - Load Index, a numerical code associated with the maximum load the tire can carry. 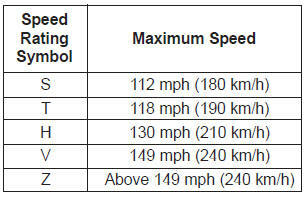 The chart below lists many of the different speed ratings currently being used for passenger cars. The speed rating is part of the tire size designation on the sidewall of the tire. This symbol corresponds to that tire's designed maximum safe operating speed. Any tires that are over 6 years, based on the manufacturing date, tire strength and performance, decline with age naturally (even unused spare tires). Therefore, the tires (including the spare tire) should be replaced by new ones. 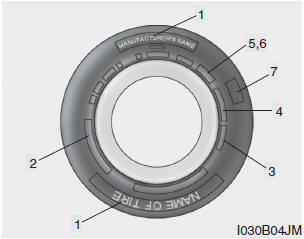 You can find the manufacturing date on the tire sidewall (possibly on the inside of the wheel), displaying the DOT Code. The DOT Code is a series of numbers on a tire consisting of numbers and English letters. The manufacturing date is designated by the last four digits (characters) of the DOT code. DOT XXXX XXXX 1606 represents that the tire was produced in the 16th week of 2006. Tires degrade over time, even when they are not being used. Regardless of the remaining tread, it is recommended that tires tread, It is recommended that tires generally be replaced after 6 years of normal service. Heat caused by not climates or frequent high loading Conditions can accelerate the aging process. Failure to follow this Warning can result in sudden tire failure, which could lead to a loss of control and an accident involving serious injury or death. The number of layers or plies of rubber- coated fabric are in the tire. Tire manufacturers also must indicate the materials in the tire, which include steel, nylon, polyester, and others. The letter "R" means radial ply construction; the letter "D" means diagonal or bias ply construction; and the letter "B" means belted-bias ply construction. 7. Uniform tire quality grading Quality grades can be found where applicable on the tire sidewall between tread shoulder and maximum section width. The relative performance of tires depends upon the actual conditions of their use, however, and may depart significantly from the norm because of variations in driving habits, service practices and differences in road characteristics and climate. These grades are molded on the side-walls of passenger vehicle tires. The tires available as standard or optional equipment on your vehicles may vary with respect to grade. The traction grades, from highest to lowest, are AA, A, B and C. Those grades represent the tires ability to stop on wet pavement as measured under controlled conditions on specified government test surfaces of asphalt and concrete.A tire marked C may have poor traction performance. Sustained high temperature can cause the material of the tire to degenerate and reduce tire life, and excessive temperature can lead to sudden tire failure. The grade C corresponds to a level of performance which all passenger car tires must meet under the Federal Motor Vehicle Safety Standard No. 109. Grades B and A represent higher levels of performance on the laboratory test wheel than minimum required by law. The temperature grade for this tire is established for a tire that is properly inflated and not overloaded. Excessive loading, either separately or in combination, can cause heat build-up and possible tire failure.